First of all a brief background for the uninitiated; Ishrat was a young Muslim lady from Mumbai, who according to official version of events was shot dead by Gujarat police along with 3 men who she was accompanying, near Ahmedabad, namely Javed Sheikh, Amjad Rana and Zeeshan Johar. The incident took place on 15 June 2004. She was 19 years of age at the time. Gujarat police claimed that the four slain were a cell of the Lakshar-e-Tayyiba terrorist group, and were in Gujarat to assassinate Narendra Modi in retribution for the 2002 riots. Her family (not surprisingly) professed her innocence. Various politicians and bodies who are of a certain political persuasion demanded an investigation into her death, claiming it to be a staged encounter. Investigations did indeed ensue, and the Central Bureau of Investigation (CBI) contends that the encounter was indeed staged; although the investigations are continuing. However questions have also been raised about whether the CBI is to be a totally neutral investigating body in any investigation which can have huge political implications, especially after “Coalgate”, where it appears that the CBI are actually helping members of the Central Government distance themselves from the scam. Nobody really talks of the other three, but Ishrat Jahan herself has become a symbol of a movement to criminally indict the Gujarat government in general, and Narendra Modi in particular, for unlawful extra judicial killings. Perhaps it is because she appears an unlikely terrorist operative, and also being a slender young lady with her whole life ahead of her, she has been appointed the mascot of this movement. It should be noted however that the fact that she didn’t fit the usual image of a terrorist could easily be the reason why she was considered to be an important asset in a high profile mission (such as the assassination of Modi). Was she a terrorist? David Headley, the Pakistani-American double agent who was involved in plotting the 26/11 attacks in Mumbai is believed to have spoken of Ishrat Jahan as a LeT recruit and willing suicide bomber. Also, a Pakistan based news source linked to the LeT said that the slain were LeT operatives. The Intelligence Bureau chief Asif Ibrahim told the PMO this year that he had enough evidence to prove that Ishrat was an LeT operative planning to assassinate both Narendra Modi and Lal Krishna Advani. Those proclaiming that she was not a terrorist cite the fact that she did not have any previous police record; but the fact is that this cannot preclude one being a terrorist. One thing which is crystal clear is that those who are saying that she is innocent (i.e. not linked in to any terrorist activities) are not interested in finding out whether or not she was really innocent. She is just a stick with which to try and beat the Gujarat government – Modi in particular. While an unconditional proclamation of her innocence is expected perhaps from her family, it is a matter of concern that the CBI, the State government of Maharashtra and the Central Government are all pushing this line. It is one thing to say “we are yet to find any evidence that she was a terrorist operative”, it is quite another to say “she was an innocent school girl who done nothing wrong and was killed for no reason by the Gujarat police.” The former is perhaps not an entirely unreasonable position to take, but the latter is unforgivably partisan. Unfortunately, it is the latter approach being taken by authorities who are meant to be neutral and professional in such matters. Those who proclaim Ishrat’s innocence with unflinching conviction have not put forward any hypothesis for several important questions, such as what Ishrat was doing around Ahmedabad? 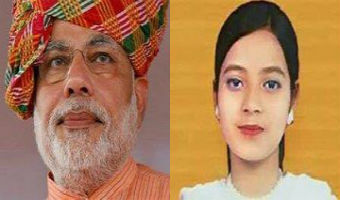 Even her mother, when interviewed, is reported to have kept repeating “how did she get to Ahmedabad. What was she doing there”. And if Ishrat Jahan was not on the radar for terrorist activities, then what motive can be attributed to the Gujarat police to single her out for the alleged fake encounter? But those who are saying she was not involved in terrorism with the conviction that only someone who had overlooked Ishrat every second of her life could genuinely have, are simply not interested in any such questions or answers.